DesertUSA Note: This article was written in November, 2000. We retain it for historical purposes. Despite the efforts of many, dating from 1968, the park never came to be. 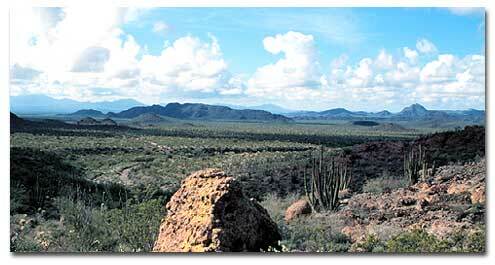 The Sonoran Desert National Monument however was established in January of 2001. It is far smaller then the ambitious scope of the plan for the national park. Taking Abbey's inspiration into the new millennium, a group of contemporary environmentalists is using words and pictures in a campaign to create the world's largest desert park. The Sonoran Desert National Park will encompass 10,000 square miles of land that, for the most part, is still nearly uninhabited and relatively pristine. "This will be the home of the largest national park in the American Southwest," says Park Project Coordinator Bill Broyles. "This is where we will save the heart of our blue skies, dry winds, and adobe souls. This is where we will preserve the essence of our way of life." Broyles, noted western author Chuck Bowden and Pulitzer-prizewinning nature photographer Jack Dykinga spent two grueling weeks in the region to draw interest to the park project. Before the most recent summertime trek into the Sonoran Desert, photographer Dykinga tempted fate in his usual fashion. "Bring it on," he said, inviting traditional 120-degree days, stifling humidity and swarms of insects that come with seasonal rains. Nature complied. Now that he and his fellow sand scuffers have again successfully been there and done that, they can recollect in rehydrated reflection and air-conditioned comfort. "It was horrible," says Dykinga with a chuckle. "And I loved every minute of it." This wasn't the first and it certainly won't be the last time that the trekking troika, leaders of a loosely-formed group referred to as Desert Rats, have crossed these sands in pursuit of photographs, inspiration or solitude. If their mentor Abbey had been a musician, this group would most likely have volunteered as back-up band. As fate would have it, Abbey's interests were more earthy, and this contemporary group of environmentalists picked up the cudgel as crusaders for creation of the park. The three aren't the only ones captivated by the region. "It's a vast ecological jewel," says Joseph Wilder, director of the University of Arizona-based Southwest Center which supports the work of environmentalists and researchers and provides a home base for the Sonoran Desert National Park Project. 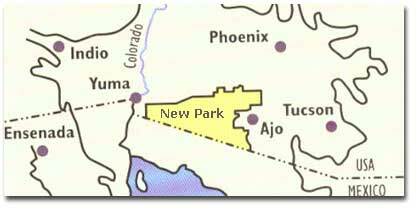 The park plan would consolidate Organ Pipe National Monument, the Cabeza Prieta National Wildlife Refuge and the Goldwater Air Force Range on the U. S. side of the border with two Mexican biosphere preserves, including the breathtakingly beautiful field of volcanic lava flow, El Gran Desierto/Pinacate that abuts the proposed park. "It's important we capitalize on the tremendous educational opportunities here," says Wilder, noting that the area serves as a research baseline for climate change, wildlife ecology, anthropology and archaeology. Even after years of meandering the U. S./Mexican border as an international traveler, Dykinga said the most recent border crossing junket produced new and interesting finds. "There isn't a square mile of this geography than isn't fascinating in some way," he says, "and each visit opens new horizons. This time it was the green islands, fresh water pozos [springs] right in the middle of all this harshness." The group also visited the coastal areas of El Golfo and made a discovery that would increase the heart rate of any paleontologist. "We found fossils in the cliffs along the coastline," Dykinga says, "sand dollar skeletons from the Pleistocene era." The beauty and serenity of the area make its preservation of paramount importance to these crusaders. "Sand dunes fall off a cliff straight into the ocean, literally where the desert meets the sea," says the lensman whose nature images routinely appear in Arizona Highways magazine. "This is the most biologically rich desert in the world meeting the most biologically rich piece of ocean there is. It's exciting to see them side-by-side and blending into each other. You can catch a glimpse of just about anything, from desert bighorn sheep to whales, as you travel Interstate 8 all the way down to the ocean." Broyles, a researcher at the Southwest Center who has hiked and camped these desert dunes for years, avidly concurs. "This is a chance to do some big thinking," he says, noting that now is the time for action on an idea that first surfaced in the mid-1960s. The park proposal was floated by former Arizona congressman Stewart Udall in the 1960’s, then-Secretary of Interior, but rejected by President Lyndon Johnson. Udall noted at the time that the Sonoran Desert Park would be "the last big decision in the lower 48 states" to save several million acres for future generations. It can't come soon enough, says Dykinga, acknowledging that Sonoran desert landscape is being eradicated at an alarming rate, an estimated one acre-per-hour in the metropolitan Phoenix area alone. "If we could keep pristine areas the way they are right now, that would be wonderful. But that's not going to happen," he says. "The amount of change I've noted over years of trips is no longer incremental, it's geometric and the pace is rapidly increasing. Each year the amount of usage climbs as people come here not just to appreciate the natural beauty, but so they can say: 'I survived Devil's Highway. Give me the tee-shirt.' You can't stop this incursion. What we're advocating is the necessity to manage it." As an outspoken custodian of the environment, project coordinator Broyles emphasizes, "No one ever regretted creating a national park. They only wish they had made it bigger and sooner. What we are putting on the table is a solution to a hoard of problems. We have already spoken strongly about this place by creating a national monument and a federal wildlife refuge. Forging this desert into a park is the logical and inevitable next step, one that is simple, timely, clean and right." "The borders of this big empty are dotted with cities. The world is teeming with people. The time is long past when we can trust ground to protect and perpetuate itself. We either protect ground that matters or see it mashed under our feet. And we protect it because it is beautiful, silent and rare, because we need it more than we can say. Every force that has already sacked other deserts, from vandalism to ignorance, is now growing in this area as population presses against the last empty refuge. The entire American Southwest is a monument to benign neglect—sprawling cities without plan or clue, dead rivers, gutted aquifers, deserts scarred by callousness and carelessness. Believing that things will take care of themselves is a notion on the border between foolishness and irresponsibility. Anyone who believes the simple drift of time will suffice for protection should take a sober look at the obliteration of large portions of this region in the last half century." The Sonoran Desert National Park Project promises advocates a steady course of action. "We will study, advocate, preserve and defend this desert. Forever." "You stand in the middle of country where you can't survive long because of inadequate water...yet you're surrounded by all forms of life that can get by on very little," reflects Bowden. "What you always find out there is yourself. The desert gives you introspection and perspective and that's the very reason we have to preserve it. Five thousand square miles is the bare minimum of what we should be setting aside to retain that sense of solitude and space." 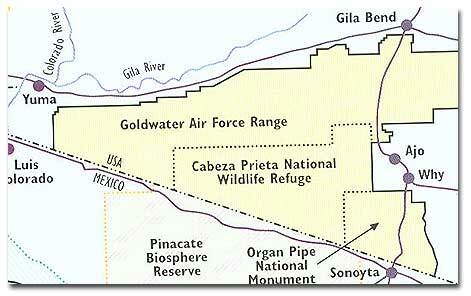 All of the land already is federally owned, entrusted to the Department of Interior, and managed as Organ Pipe Cactus National Monument (NPS), Cabeza Prieta National Wildlife Refuge (USFWS), and the Barry M. Goldwater Air Force Range (BLM). The military has acquired the state trust land in the Goldwater. About 1,116,016 acres are congressionally designated wilderness areas and 191,000 acres have been assigned special status as Areas of Critical Environmental Concern. No lodging is available in the Organ Pipe Cactus Monument. Motels and other lodging are available in the towns of Ajo, Gila Bend and Tucson. Click on the cities above for rates, availability and reservations online.